While many "music" fans look at Air Supply as nothing more than pop fluff, they are missing the point entirely. Air Supply may not have rocked out, they were never surrounded by controversy and they certainly didn't have much very much street cred... but the Australian duo (Graham Russell and Russell Hitchcock) never claimed to be anything than what they were: creators of radio-friendly pop nuggets that often veered close to melodic masterpieces. Air Supply had previously released albums in Hitchcock's native Australia (Graham was a transplanted Englishman), but they didn't start making waves until their single "Lost In Love" was remixed and edited for the American market. This 1980 debut U.S. single was as close to 'perfect' as pop could get: great melody, great vocals and great arrangement. The song became a massive hit and proved to be the beginning of a long career that continues three decades later. The single was followed by the album Lost In Love, which also featured the hits "All Out Of Love" and "Every Woman In The World". Though not every track on the album was released as a single, each song features the now-familiar Air Supply pop formula, which makes for a warm and inviting album of pop gems. Yes, it does get schmaltzy at times, but what's wrong with that? In 1981, the duo released The One That You Love, another corker of a pop album! The album contained even more hit singles, including "Here I Am (Just When I Thought I Was Over You)' and "The One That You Love". And once again, the album is filled with plenty more where those came from! While not a 'hits' package, Robinsongs/Cherry Red has issued this fantastic two-fer which contains both complete albums on one CD. You get six bona-fide hit singles plus many fan favorites that will take the listener back to happier times when Top 40 music was actually created by real people.. for real people. I'm not the only one that thinks Air Supply deserves a lot more respect: I'm just the only one that will publicly admit it! 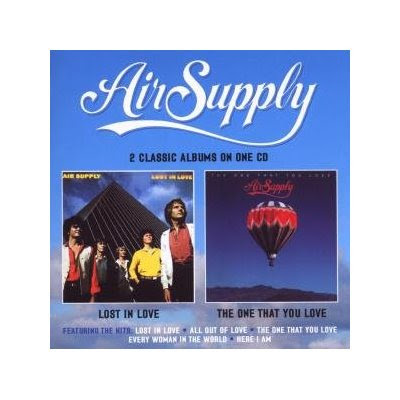 AIR SUPPLY-Lost In Love/The One That You Love (Robinsongs/Cherry Red) is available NOW!